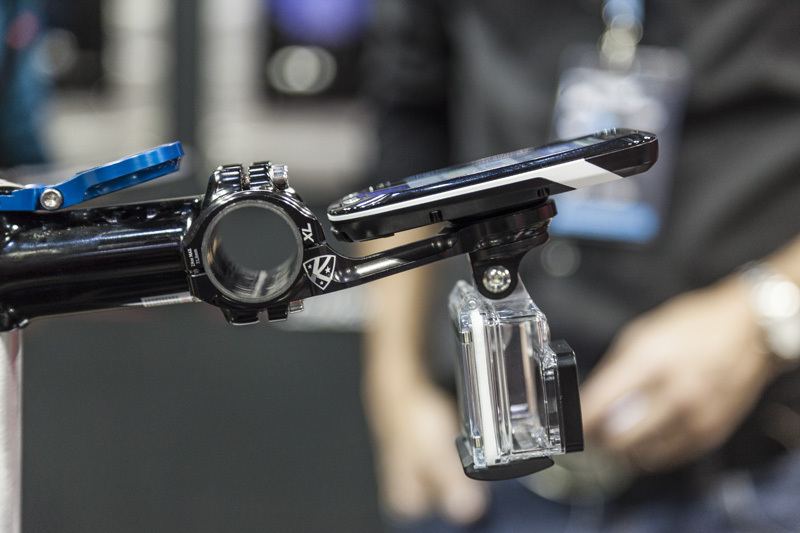 With more than 70 brands under one roof, there was plenty of new kit on display at iceBike 2015. Here are some of our favourite products from the show. This week sees the iceBike trade show taking place at Stadium MK in Milton Keynes. 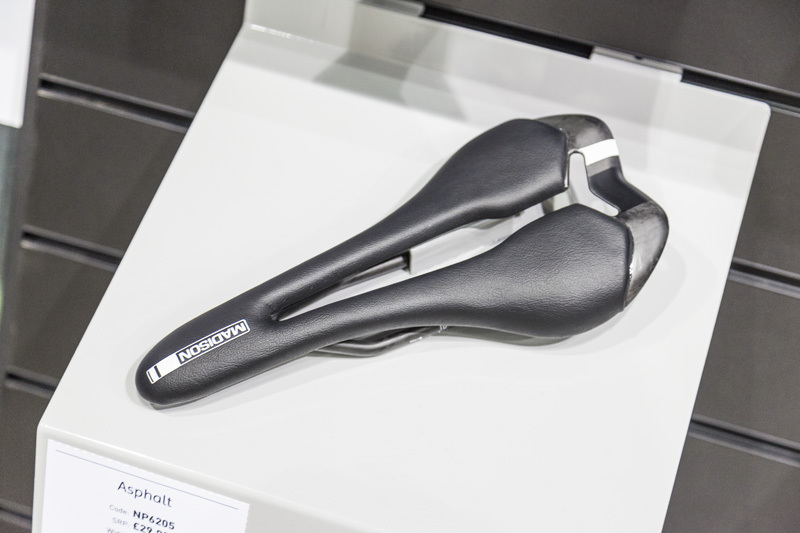 The in-house show of Madison, the UK’s largest cycling distributor, there were plenty of new products on display, and here are just a few of our favourites. 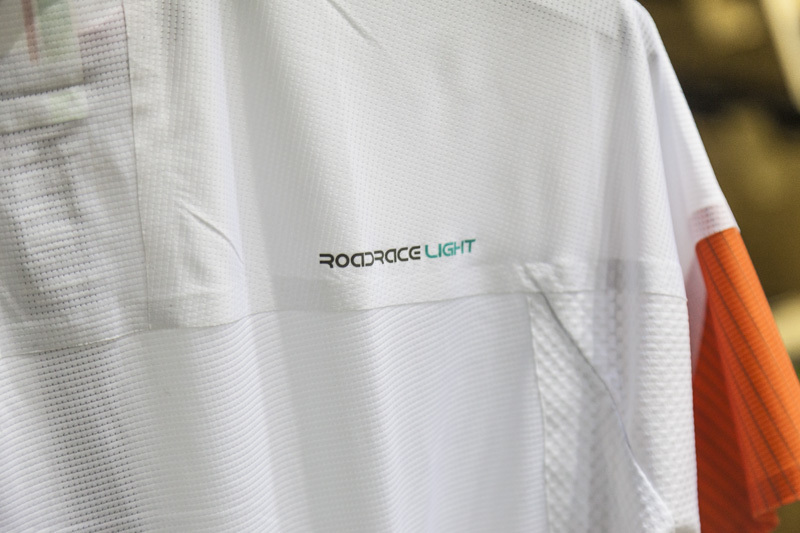 New for spring/summer 2015 is the top-end Road Race Light clothing range from Madison. 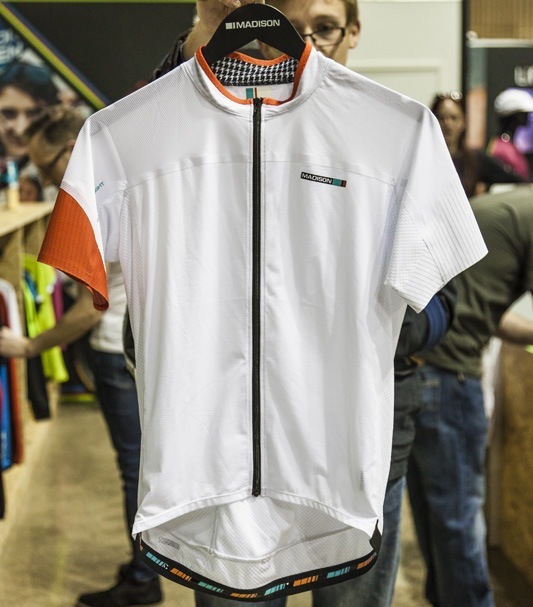 Consisting of a short sleeve jersey, long sleeve jersey and bib shorts, the new range was developed alongside the Madison-Genesis pro team over the course of the 2014 season, with extensive input from Andy Tennant and co. in the details of the range. The focus of the Road Race Light range is very much on performance with the short front and longer rear of the jersey promising to provide a close fit even when riding on the drops. The jersey also features mesh panels under the arms and on the side panels to aid airflow. Pricing and availability is still to be confirmed, but Madison tells us that the jerseys will be around £65 and the shorts £90, with stock hopefully available from late May. Madison was also showing off its extensive range of saddles, including this new top-end Road Race Carbon model. As you can probably guess from the name, this is a lightweight model with UD carbon-fibre used for the shell and rails, and ultralight foam for padding. The model on show at iceBike was only a prototype, and public availability is still a couple of months away, but Madison are giving a very low claimed weight of 120g, and a half decent price of £149.99. 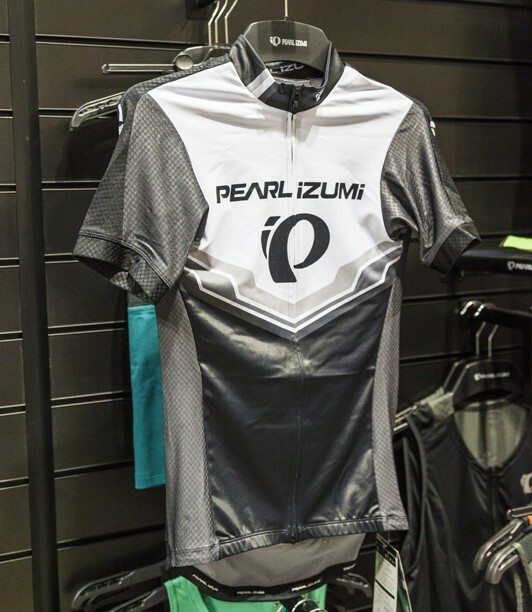 More new clothing comes courtesy of Pearl Izumi, with the overhauled P.R.O. and Elite ranges. Our favourite piece from the collection was the P.R.O. Ltd Speed jersey, developed alongside the BMC Racing. This is an aero-minded short sleeve jersey, which includes anatomically cut sleeves which are angled forward to fit well while riding on the drops, a design that Pearl Izumi is in the process of patenting. Expect the price to be around the £90 mark. 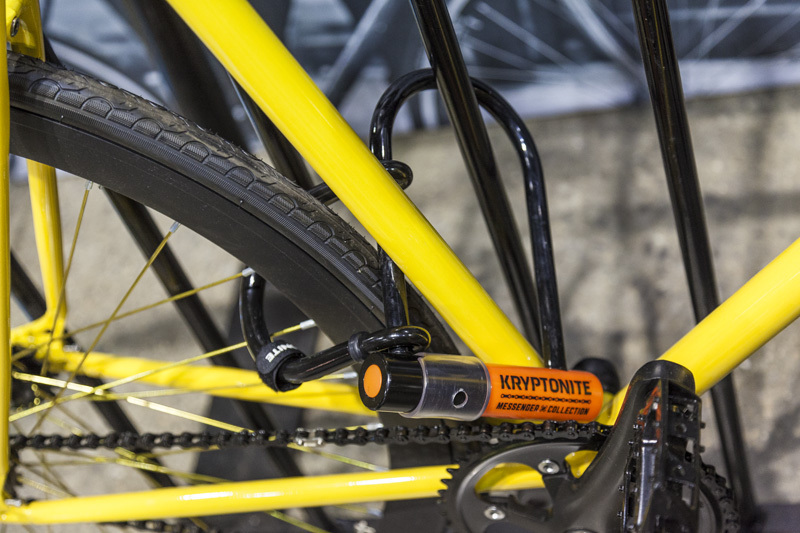 Kryptonite had their new Messenger collection on display, a small range of products developed in collaboration with bike messengers in New York which aim to offer the same level of security as their standard locks, while being easier to carry and usable in plenty of different scenarios. The Messenger Mini is essentially an elongated version of the company’s Mini-5 D-locks, making it easier to attach to railings and rails, while the reduced diameter of the rail reduces the weight. For an extra £3 you can get the Messenger Mini+ which includes a wheel extender loop, making it easier to lock up both your frame and wheels with one lock. However perhaps the cleverest pieces of tech on show were the Security WheelNutz. 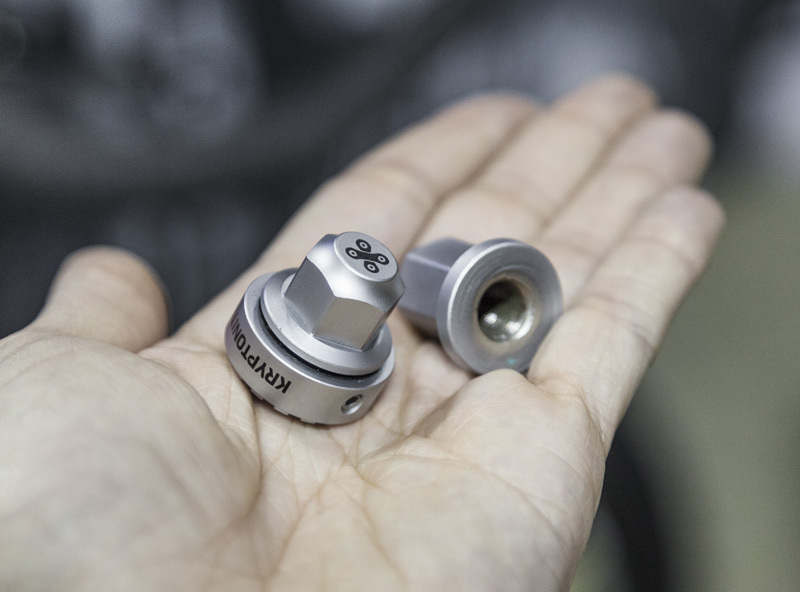 These are essentially a pair of wheel nuts which attach to your front skewer and mean that your front wheel can only be removed if the bike is turned upside down – not something that’s easily done if it’s locked up. A pair will cost £24.99 – not cheap for a pair of wheel nuts, but certainly less than the price of a second lock to secure your front wheel. There was also plenty to see on the Lazer stand, most notably their extensive new “MOi” range of women’s helmets. 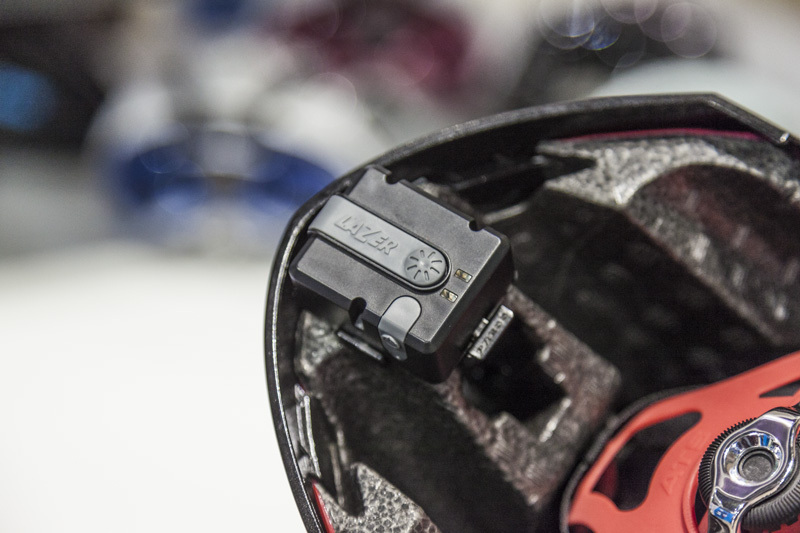 The helmets use Lazer’s RollSys adjustment system that places the adjustment dial on the top of the helmet rather than at the rear, meaning that all of the MOi range is marketed as “ponytail friendly”. The range is pretty large, and thankfully not all pink, with the top-end covered by the £199.99 Cosmo helmet, which includes a detachable aero shell and a definite focus on the road racer, all the way down to the £29.99 Summer helmet. Another neat thing we saw on the Lazer stand was the company’s new i-Sensor technology. 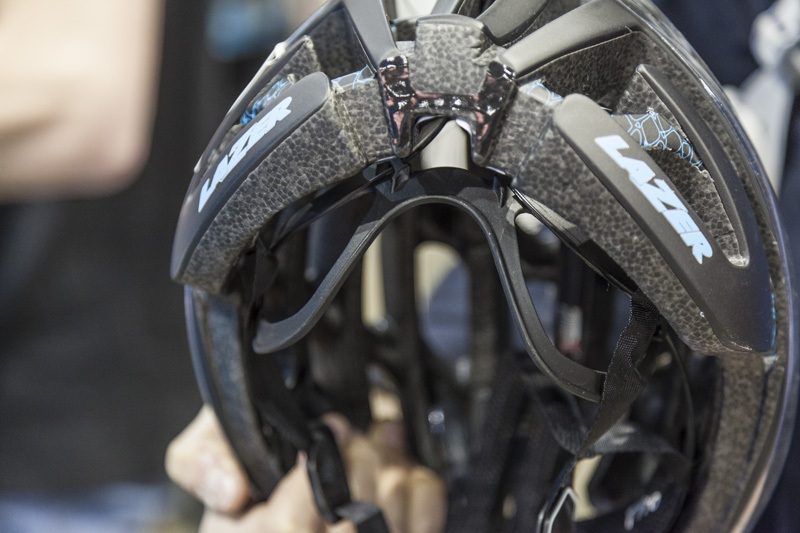 Recently ridden to a world record by the Australian women’s team pursuit squad at the Track World Championships, the system is a small box which sits in the helmet and alerts you by sound or vibration whenever you’re head moves from a pre-configured aerodynamic position. The i-Sensor system will be available on Lazers Wasp and Wasp Air time trial helmets, and although there’s no confirmed pricing just yet, word on the street is that the cost will be an extra €150 (approximately £110) on top of the cost of the helmets. 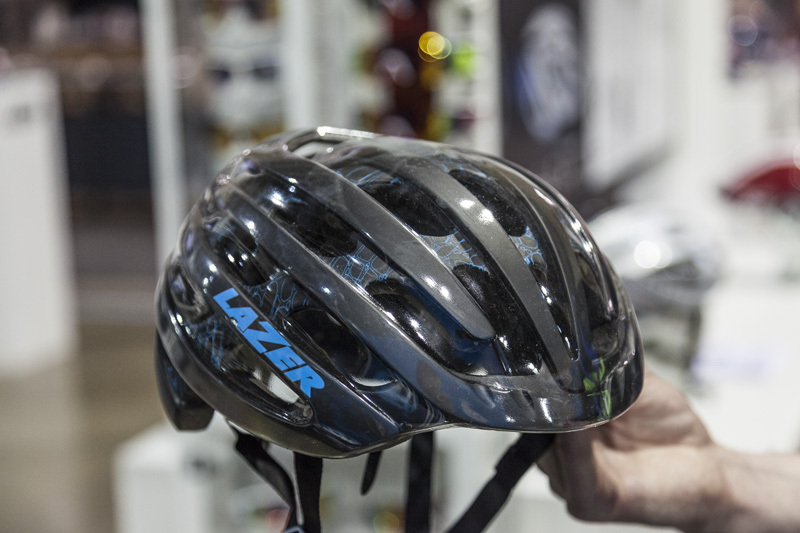 The final piece of product news from Lazer was the new LifeBEAM system, effectively a heart rate monitor integrated into the front of the helmet, eliminating the need for a chest strap. 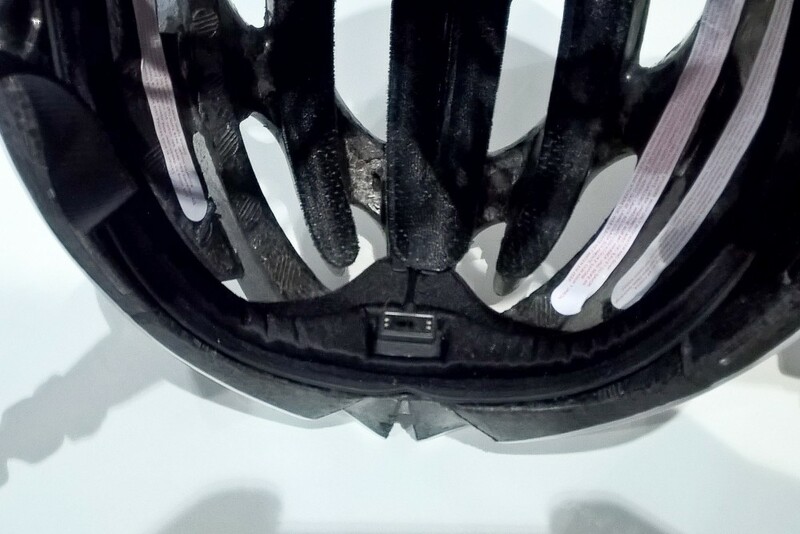 Data is transmitted via both ANT+ and Bluetooth via a wireless transmitter attached to the rear of the helmet, and while the current version only measures heart rate and calories burnt, future models could have the ability to analyse the electrolyte content of your sweat to monitor for dehydration. The system is currently available only available on the Genesis helmet, and costs £199.99. 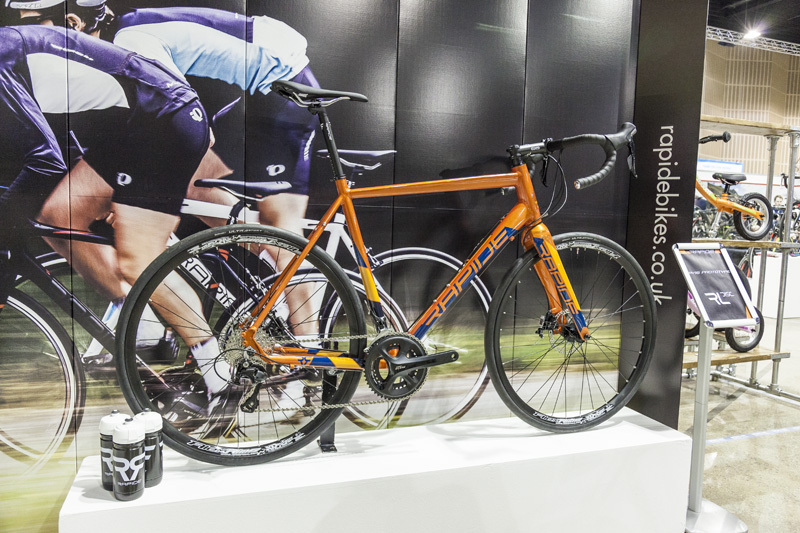 From the people who brought you Ridgeback and Genesis, Rapide is a new brand launched last summer with a range of four carbon and five alloy bikes. Despite being a new name, Rapide is already planning for the future with a new disc version of the RL3, the company’s top-end alloy model, which is in the pipeline for 2016. The prototype on display at iceBike came with a carbon fork with enough clearance for whopping 42mm tyres, 11-speed Shimano 105 gearing, mechanical discs and disc-specific wheels from Alex Rims. Pricing is still to be confirmed, but Rapide is looking to sell the Disc RL3 at around £1149, with lower priced RL2 and RL1 versions, with Tiagra and Sora groupsets respectively, also on their way. K-Edge first developed an aerodynamic version of their out-front Garmin mount while working with Team Sky ahead of last year’s Tour de France, and are now offering the Aero Combo Mount which will also hold a GoPro (or other action camera) beneath the Garmin. The aero qualities of the mount mean that the computer is held closer to the bars, meaning that it is only compatible with Garmin Edge 200, 500, and 510 computers, so owners of 800, 810 and 1000s will have to look to the non-aero XL Combo mount for their cockpit decluttering solution. The new Aero Combo mount is priced at £44.99 with black the only colour available. 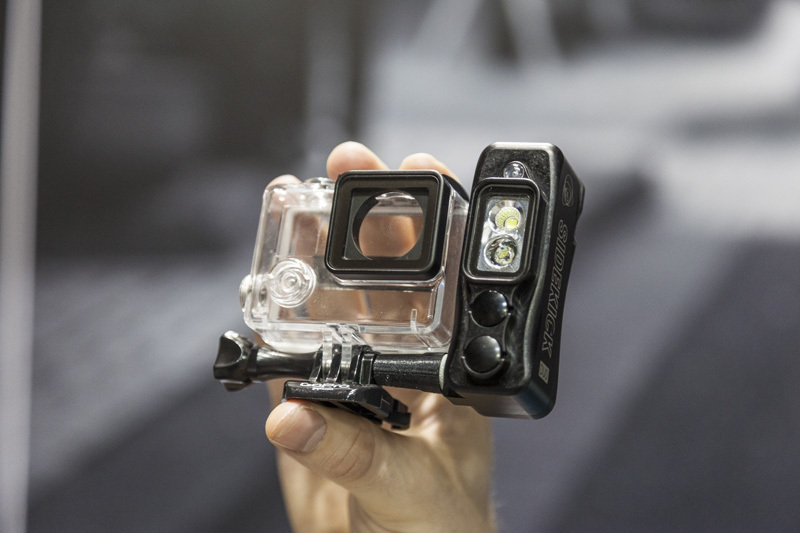 Another new GoPro related product came courtesy of Light & Motion and the new Sidekick companion light. Launched on Kickstarter at the start of this year, the Sidekick aims to solve the problem of poor quality video when shooting in low light conditions, emitting a 600-lumen flood beam to provide enough light for decent images. The Sidekick Duo seen above also includes a 400-lumen spot beam allowing it to double as a decent front light. The light is secured using a simple arm that attaches to existing GoPro mounts and has a claimed battery life of between 1 and 4 hours – nothing amazing but recharging should be easy enough with a simple USB cable. The Recon Jet smart glasses first appeared on our radar back in December, so we were looking forward to setting eyes on a sample pair at iceBike. 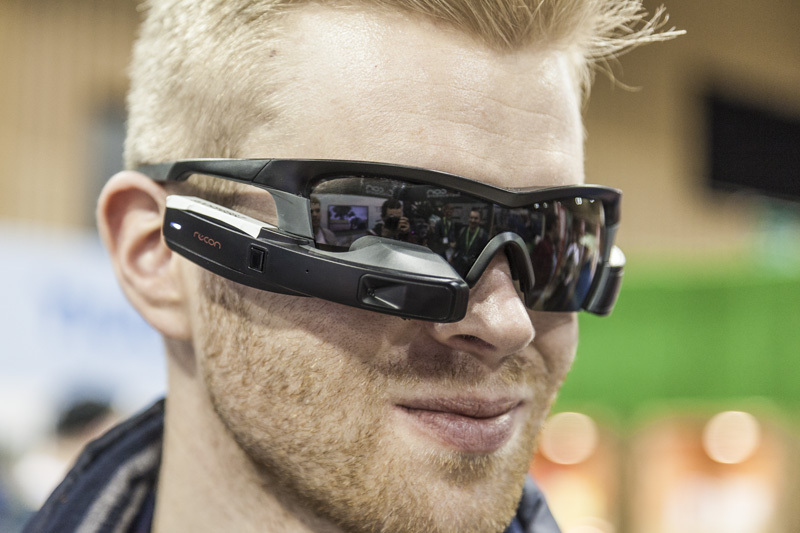 The glasses feature a powerful microcomputer, sensors and GPS which collect a large range of metrics which are then projected onto the glasses just below your right eye, as well as a HD camera which can shoot photos or videos. With both ANT+ and Bluetooth capabilities, the Jets are compatible with pretty much every speed, cadence and power meter on the market, and can also connect to your smartphone, allowing you to instantly upload videos and photos to social media. As you’d expect, this sort of technology doesn’t come cheap, with a pair setting you back £589 (although this is a relative bargain compared to the £1000 price-tag that Google Glass commanded), and we certainly weren’t entirely convinced by large amount of extra bulk that the Jet added, so we’ll wait to see whether the market really exists for this sort of technology. 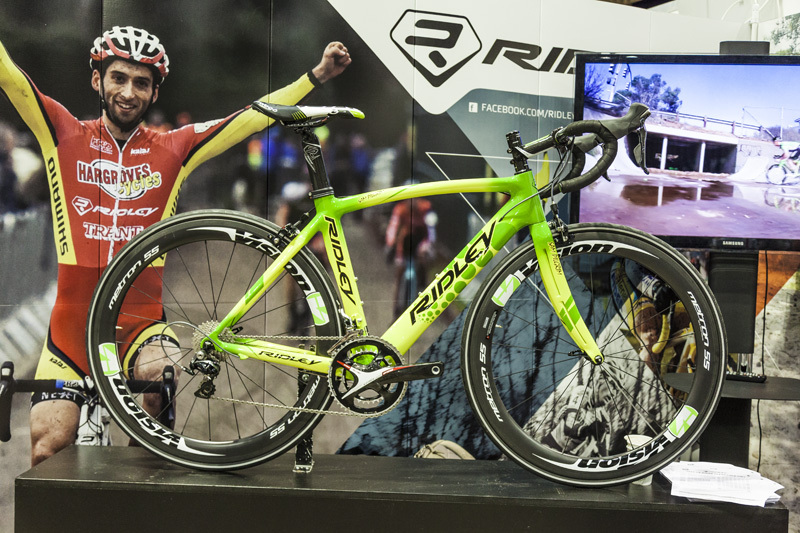 Ridley had not one but two unique bikes on display: Tony Gallopin’s yellow Helium SL from his one day in the yellow jersey on stage 10 of last year’s Tour de France, and the Noah used by Sam Pilgrim in Road Bike Party 3. For a bike that has certainly received a lot of abuse in its short life, the custom-painted Ridley Noah looked in pretty good nick, with the FSA K-Force Light crankset and Shimano Dura-Ace drivetrain looking in perfect working order, with the same being said of the FSA finishing kit and Prologo saddle. However the beady-eyed amongst you will note the Vision Metron 55 wheels, rather than the Metron 81 wheels used in the film, which we’re guessing are not quite in working order.